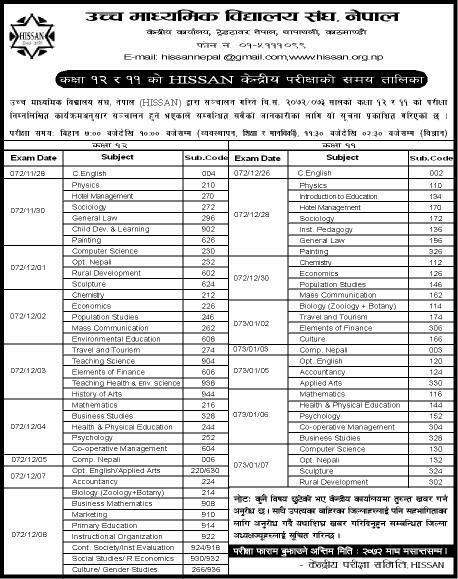 Higher Secondary School’s Association Nepal (HISSAN) has published the routine of Grade XI and XII Pre-board exam for the academic year 2072-73. According to the notice, Pre-board exam will begin from Falgun 28 for grade 12 and from Chaitra 26 for grade 11. I think subject planning of both routine are right…. Q At what height above the surface of the earth the acceleration due to earth gravity is 0.98 m/s2 ???? When will the HSEB result be published?